Husky Injection Molding Systems Ltd. is the world's largest brand name supplier of injection molding equipment and services to the plastics industry. Husky designs, manufactures and integrates the industry’s most comprehensive range of injection molding equipment, including machines, molds, hot runners, auxiliaries and integrated systems. With more than 40 service and sales offices and employing approximately 4,000 people worldwide, Husky supports customers in over 100 countries. Husky began applying Prosci change management to a strategic initiative at the recommendation of a strategic partner. The team immediately recognized the value that such an easy-to-use and powerful methodology brought to their organization. “The Prosci methodology and materials have been instrumental in raising the level of awareness for a more structured and disciplined approach to change management at Husky. The simplicity of the ADKAR® Model makes it easy for the facilitator and participants to apply to real life scenarios. Introducing this methodology to Husky has increased the desire to incorporate change management into overall project plans that in turn have, and continue to, ensure we maintain our position as a top industrial leader in our field. To achieve results on a high-impact strategic initiative, and to begin embedding change management capability throughout the organization. While a strategic initiative originally brought the role of change management into the spotlight, Husky decided that based on its past experience with Prosci’s change management methodology it was time to expand its application to other projects. Husky decided to embrace Prosci as its organizational standard for change management. By using the simple framework of the Prosci ADKAR Model, project managers of the strategic initiative were able to easily convey the value change management brought to the project and how other project team members and people managers could support their staff in reaching adoption and utilization of the new solution. The results on this project also inspired further awareness of change management throughout Husky. With a Prosci license, Husky can now provide employees with role-based training and tools to build awareness of change management and ability to apply its principles to their daily work and to other strategic initiatives. 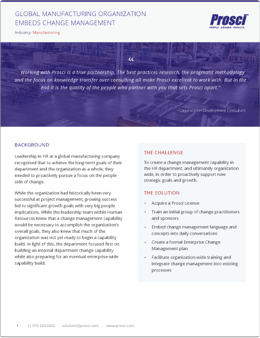 Husky is one of many manufacturing organizations to use the Prosci change management methodology as the standard for their change management capability build. Read how another manufacturing organization accomplished an organization-wide shift in company culture, resulting in projects with high employee engagement, less negativity, and more project success, in this success story. A global manufacturing company created change management capability in the HR department, and ultimately organization wide, in order to proactively support new strategic goals and growth.